City and Liverpool are both on 65 points with City having the better goal difference although they have played one more game than their rivals. Third-placed Tottenham Hotspur, who beat Leicester City 3-1 earlier on Sunday, are five points behind. Aguero, who scored a hat-trick seven days ago against Arsenal, has now equalled Alan Shearer's record of 11 Premier League hat-tricks. Raheem Sterling fired City ahead in the fourth minute with a side-foot finish after a quick free-kick from Kevin De Bruyne had caught the Chelsea defence napping. After Aguero had somehow missed an open goal from two metres, the Argentine promptly beat goalkeeper Kepa Arrizabalaga with a blistering strike from 25 metres. A poor header towards his own goal from Chelsea's Ross Barkley gifted Aguero with City's third goal and then a low drive from Ilkay Gundogan made it 4-0 after 25 minutes. 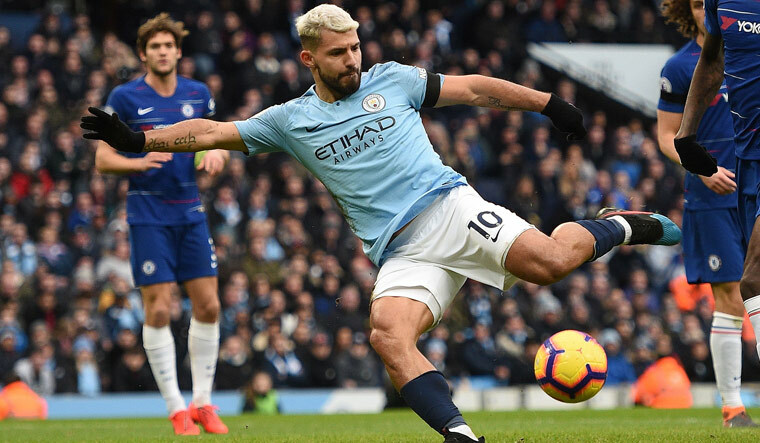 Following the break, Aguero, who also became City's top scorer in league games, headed against the bar before he completed his hat-trick from the penalty spot after Sterling had been brought down by Cesar Azpilicueta. Sterling completed the rout, turning in a low cross from Oleksandr Zinchenko in the 80th. The defeat was Chelsea's worst since their 7-0 loss to Nottingham Forest in 1991.